The perfect WP theme for restaurant/bar owners showcasing your food menu, your location and allowing for online reservations all the while presented in a slick and spacious layout, powered by custom post types and some additional WooFramework features. The Diner home page showcases food specials, menu items, business hours, reservations options, a featured slider and a general information module most of which can be placed and enabled/disabled. Most importantly it is showcased in a clean and spacious layout. A food menu template allows you to showcase all the food items on your restaurant’s menu. 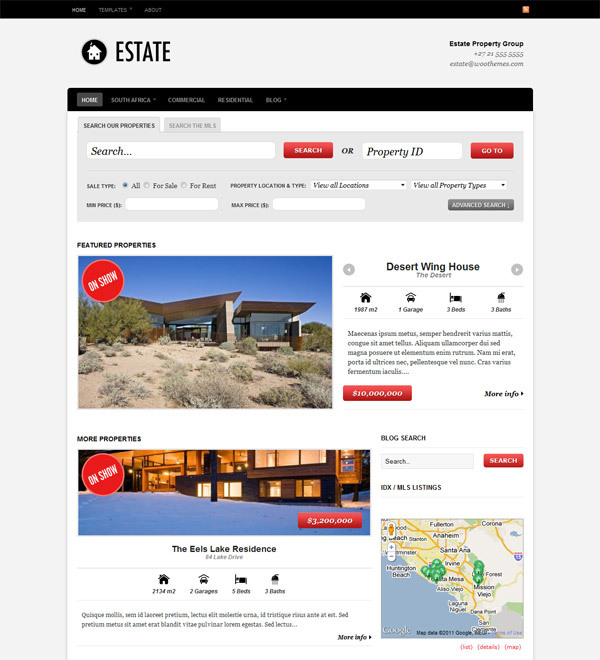 A site visitor can arrange the menu items according to price or rating. Your restaurant customers can then rate the meal they had at your restaurant. Diner comes with in-built functionality capable of taking table bookings for the restaurant. You can set your opening and closing hours, average length of a sit-down booking, and then view/manage orders from your WordPress dashboard. 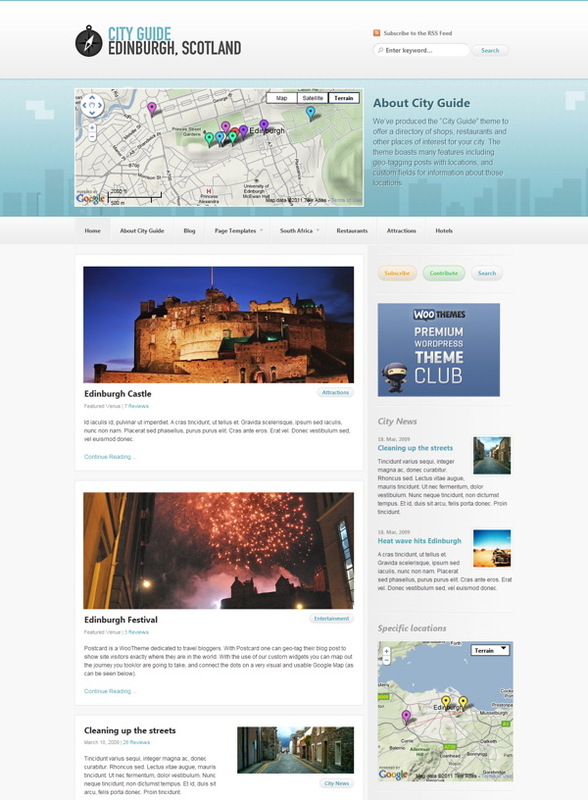 A location page template helps site visitors determine where the restaurant is and with Google Maps integration one can get directions to the restaurant without leaving the website. The featured slides, food menu items and reservations are delivered through the all new Custom Post Type functionality in WordPress 3.0, so it is easier than ever to add new posts. 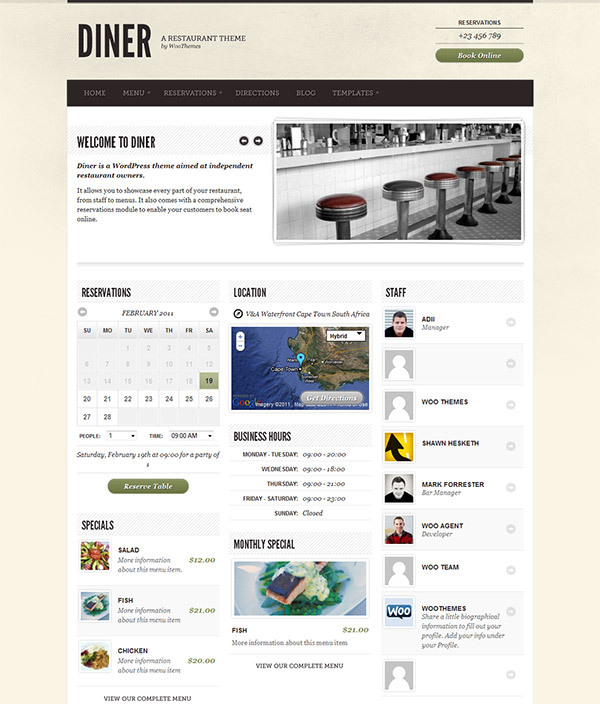 The theme has 8 widgetized areas, and as always comes with custom Woo Widgets – 15 in total in Diner. The theme includes 11 alternative color styles which you can preview in the demo.